In order to put the parts together, I needed to drill some holes in a 24 inch long dovetail bar from Losmandy. Surprisingly, even with all the holes that are pre-drilled, none fit the foot of the 400mm EDIF lens. Thus, I had to make some new holes. 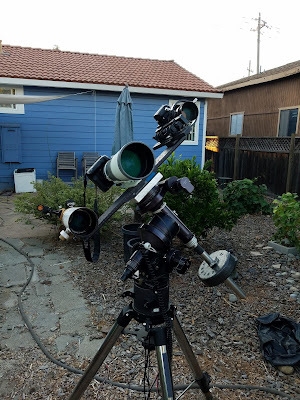 The next step was to put the Stellarvue 70ED on the bar, which also didn't have proper holes. 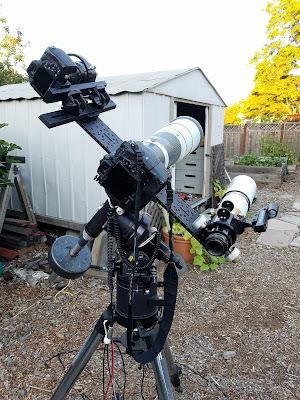 Unfortunately, these did not offer a good spacing so I had to use a Vixen-style dovetail to hold the telescope foot. Then I had to steal parts from my old K10D setup to properly mount the camera with 300mm lens. 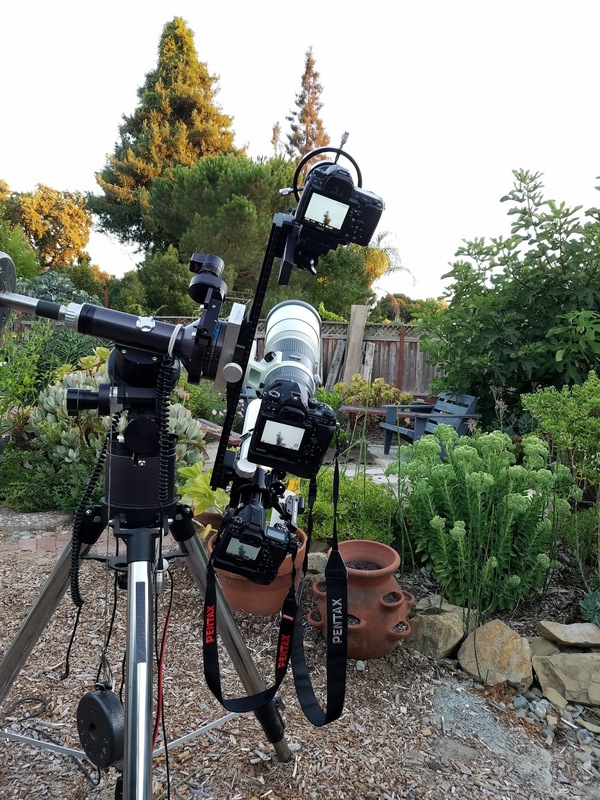 It's important to me to be able to align the camera body with the ecliptic so that the corona has the most amount of space across the sensor. Here's how it looks after assembled. I was surprised at how well-balanced the bar is. For the chance to check pointing, I tried aligning the cameras on a distant object. Unfortunately, the moon was not visible, so I had to settle for the top of a tree about a hundred feet away. The last steps are to weigh this bar with the cameras to determine if it's over a 30 lbs threshold that I use for the Losmandy GM8. If it's heavier than this number, then I'll need to consider bringing the G11 instead. I prefer the GM8 since it folds smaller. 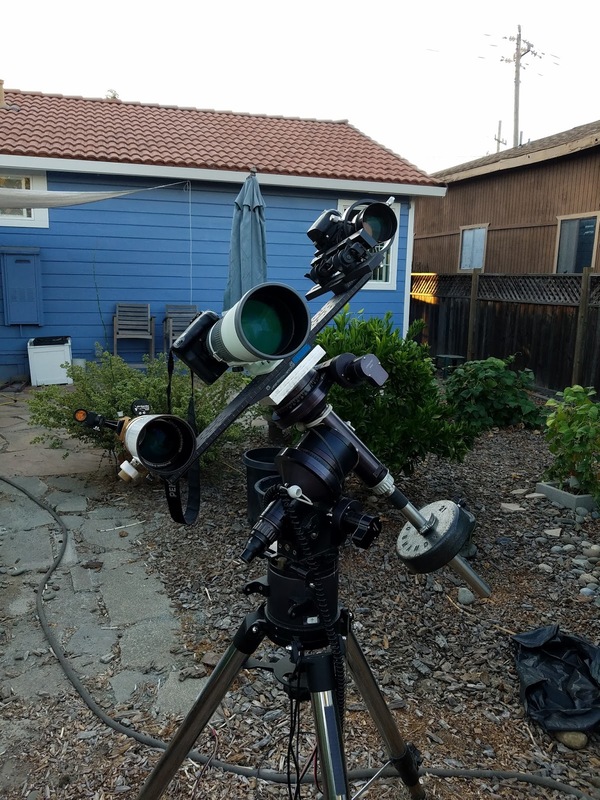 Also, I'll need to put a RACI finder on the bar so that I can do star alignment the night before the eclipse and do polar alignment with a webcam.